Gardening is not just an ordinary pastime as science has proven it to be the best choice when it comes to illness prevention and healing. Studies reveal that gardening promotes physical and mental health through satisfaction and relaxation, as well as better nutrition. Gardening can have a positive impact on a person’s overall wellbeing and is useful in assisting those who have special needs, including people with mental health problems or recovering from physical illness. With all these remarkable benefits, it is safe to say that gardening is indeed a great, inexpensive therapy for both mind and body. One of the incredible advantages of gardening is its capability to heal and calm one’s mind. Gardening may protect the mind against the risk of Alzheimer’s disease, as well as fight off depression and make a person smarter. For this reason, you may find healing gardens nowadays being installed in some institutions that range from hospitals to business centers including penitentiaries. One long-term study monitored about 3000 older adults for around 16 years. Researchers tracked the incidence of all types of dementia and evaluated a variety of lifestyle factors. They discovered that daily gardening provided the biggest risk reduction for dementia as it reduced the incidence by 36%. Another study showed a significant outcome as it estimated the risk reduction at 47%. Gardens and gardening have been long recognised as a therapy for people who have Alzheimer’s disease. The conclusion is that a garden can help stimulate the brain with refreshing colour and scent. Also, it provides individuals a contained and simple world, which holds a past and present reality. Since gardening is proven to reduce the risks of Alzheimer’s, there is no doubt that it can also help people with depression and other mental illnesses. A harmless bacterium called Mycobacterium vaccae typically found in the dirt is believed to stimulate the production of norepinephrine and serotonin in a human’s body similar to an antidepressant medicine. It has the ability to help the body regulate the essential balance of chemicals in your brain. Thus, warding off depression and improve the brain health. Researchers usually notice in their studies that subjects who partake in gardening have positive mental outlook. An excellent way to get Vitamin D and a form of moderate exercise – why and how does gardening makes such difference? Vitamin D from the sun has been proven critically essential for a person’s health given that it regulates phosphorus and calcium levels in the body. The best way to boost vitamin D in your body is by exposing and working outdoors under the morning sun. If you expose your hands, arms, legs and face to sunlight 2 to 3 times every week for several minutes, your skin will be able to produce enough vitamin D. With gardening, you can accomplish productive projects and at the same time get sufficient Vitamin D.
While comprehensive research on the physical advantages of gardening is limited, it’s extensively accepted that gardening is a form of moderate workout. Gardening allows your body to move in different actions such as bending, digging, pruning, lifting, stretching and reaching. These movements can build and tone muscles, strengthen your bones and extend your flexibility. It can also increase blood circulation, leading to lowered blood pressure and quick healing. That is why gardening has been found to help inhibit type 2 diabetes, strokes, and heart disease. While planning for a gardening schedule in advance, don’t forget to ask a chiropractor about the appropriate exercises to do as you need some warm up before heading out to your backyard. When it comes to gardening, proper clothing is necessary. Too many layers of clothes will keep your back warm and absorb the sweat. Don’t spend too long on one job, change between tasks. Instead of bending over, just try to squat down so you can avoid a painful back afterwards. In addition, when lifting heavy objects, maintain a straight back through bending at your knees. 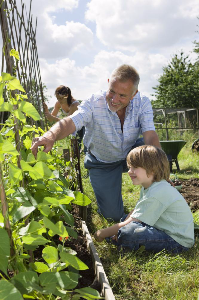 It is important to prepare your body for this kind of physical activity so you can make the most of your gardening routine and its healthy benefits. Aside from the physical and mental benefits, gardening can offer you with fresh and healthy food as well as the joy of seeing plants you nurtured day by day. It’s an activity that any person can engage in. Get additional chiropractic tips for preventing muscle strain and upholding a healthy back while gardening from your reliable Gold Coast chiropractor here at Hinterland Chiropractic. We also provide useful guidelines and solutions on how you can achieve optimal wellness through a safe and natural means. Call us today on 07 5527 3133 or simply book your appointment online. Experience the benefits of the chiropractic lifestyle today!